For customers that need the benefits of an expert maintenance program, yet want the flexibility of determining the total spend on their fleet, Hogan’s “PM PLUS+” program is a great solution. We manage the preventive maintenance services on your fleet, just like we would on full service lease or guaranteed maintenance program. You’re provided with deeply discounted labor & parts pricing for other repairs. Comprehensive Preventive Maintenance (“PM’s”) INCLUDED IN MONTHLY PRICING - The strict in-house Preventive Maintenance Program at Hogan is the most important factor in getting your truck to its destination -- on time -- every time. Our commitment to preventing failures by performing extensive vehicle inspections on a monthly or mileage interval, whichever comes first, will insure that your equipment will always operate at peak performance with maximum fuel economy. 24 / 7 Emergency Road Rescue (800-666-3338) – available to you. At Hogan, we believe the best road service is a meticulous preventive maintenance program. However, when road failures do occur, Hogan’s Road Rescue program features 24/7 nationwide coverage. Our staff of qualified Hogan technicians has the knowledge and experience to get your driver back on the road quickly and safely. Towing Coordination – available to you. Hogan will, at your request, coordinate your towing needs resulting from a mechanical failure. Fuel Services / Discount Fuel Program – available to you at any Hogan full service fuel location in the US. 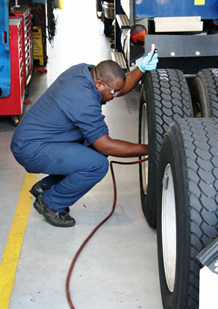 Our fuel island attendant performs a multi-point inspection which includes checking belts, hoses, tires, fluid levels, tire inflation, lights, as well as washing the windshield. Contact a Hogan FLEET MAINTENANCE representative today.